7000 Sq. Foot Restaurant Facility in High Traffic Area! Price Just Reduced, Motivated Seller! 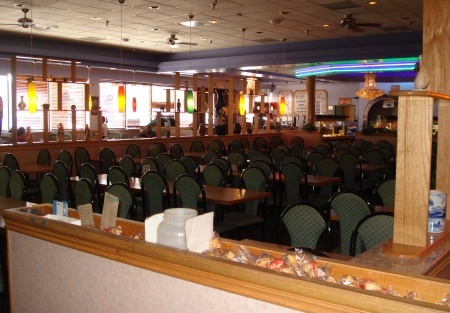 This Chinese Buffet is located in a busy strip mall in the heart of Antelope Valley. You will be impressed by the size, condition and potential. There is approx. 7000 square feet seating approx. 190 people and a large private banquet room seating approx. 75 people. The kitchen is well equipped and can accommodate a large volume of food. It has 2 large walk in refrigerators, 2 freezers(one a walk in),8 woks, a large hood, several prep tables, too much to list. Banquet room has potential to bring additional income for private events. The rent is currently $10,700 including CAM charges. There is approx. 2 years left on the lease. Landlord is willing to negotiate a new lease for a longer term. There is plenty of parking available in this strip mall. Seller is in process of obtaining beer and wine license in the next 20 days, adding more potential for additional income. Sellers have never managed a restaurant before purchasing this buffet. They don't feel they have the proper management experience to successfully operate the business and have made the choice to sell. Take the next step and complete the online confidentiality agreement and you�ll be provided with the restaurant name and address. Also you will given priority notification to new listings in the future, prior to the general public, giving you the best chance to �scoop in� the best opportunities. There are also more photos available to our registered buyers. This is a a Paramount Restaurant Brokers, Inc. listing. Chinese Buffet located in a busy strip mall in the heart of Antelope Valley. Seating approx. 265 people total. Private banquet room seats approx. 75 people. Banquet room can bring extra income from private events. Kitchen is well equipped and can accommodate a large volume of food. 2 Walk in refrigerators, 1 walk in freezer with an additional 2 door freezer.